In early 2018, we invested in an LED machine. Whilst most LED face masks only have around 100 lights, ours has 552 LED lights, making it much more effective. 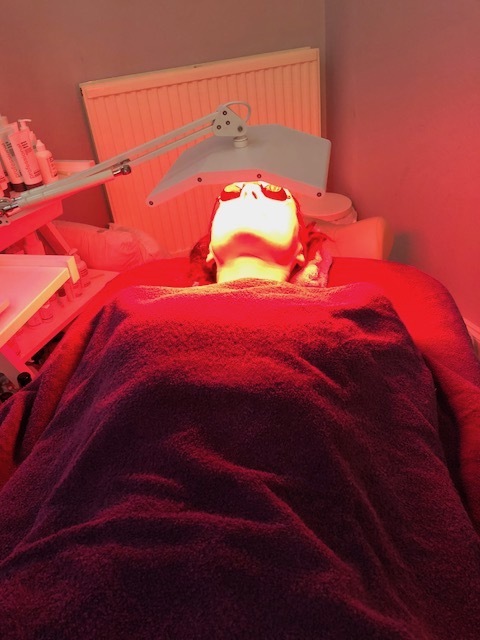 The use of LED light in facial treatments is often referred to as ‘Light Therapy’ or ‘photo-rejuvenation’. The lights stimulate a response in the skin, including killing bacteria within it or strengthening and regenerating it. LED light stimulates the production of ATP, an essential energy source for the body’s cells (namely the mitochondria). The light excites the mitochondria and it is believed that when it travels deep into the layers of the skin it allows the production of 10 times more ATP than usual in the mitochondria. As we age, our levels or ATP are significantly reduced and our body’s ways of keeping up with demand can result in the production of more free radicals, that in turn cause cellular damage. The cell’s mitochondria can also decrease as they die off after mutations occur. The body does not store vast quantities of ATP, so we need to have continuous supplies of it. Light is a great solution to low ATP reserves. LED light is very different to UV light. We know that the sun’s rays (UV) can be very damaging to skin, increasing signs of ageing with visual changes including increased wrinkles, fine lines and pigmentation. UV light is also believed to damage cells that can lead to skin cancer. Scientific studies have shown that controlled levels of LED light can actually be beneficial to the skin. Blue and red light are absorbed by the skin & are known to have therapeutic properties. This is because the energy from the LED light stimulates activities in the cells, promoting a healing response. Who is LED treatment suitable for? LED treatment is suitable for all skin types. This type of treatment is also ideal for younger skins, especially those suffering with acne. There are no side effects and the lights do not produce harmful light that is hot or damaging to the skin. The optimum treatment pathway is two uses per week. One treatment will give the skin a boost but if you are struggling with acne or inflammation or want to reduce signs of ageing you will want to follow a course of treatments. What is the difference between Red LED light and Blue light? Blue light is used for inflamed skin and acne. The light is absorbed by the molecule Porphyrin. This is found in the bacteria in skin pores and cells (P-acnes) and is the cause of acne. LED light is effective as it creates free radicals, neutralising/killing the bacterial cells. Blue LED can decongest the skin as well as normalise the production of sebum, the skin’s natural oil. As a result of killing bacteria, skin pores can shrink and future breakouts can be prevented. Red light can be used with blue light. We use a purple light in this instance. In the case of acne, red light can be soothing as it provides an anti-inflammatory response. Combination lights (purple) can also be great for irritated skin. Red light is proven to stimulate the production of collagen and elastin. These are important elements in providing strength and elasticity to the skin. The wavelengths that produce red light are known for their wound healing properties. This is therefore also useful to improve skin texture, fine lines and deep tissue healing. With is high nanometre range, red light can travel deeper into the skin than blue light. The stand alone treatments involve you coming in to lay under the LED Light Therapy lamp for 15 mins. No other treatment is required. Age 16 or under receive a further discount. Please enquire for details. *Please note that there is a 50% charge for any appointments made and not attended or with less than 24 hours notice, as we are likely to be unable to fill that treatment slot. S95 Sterilising boxes and bags. Buy one treatment, get one half price! Kerry is very thorough in finding the areas that need treatment and working on them through your feet. I would certainly recommend receiving reflexology from Kerry as you will certainly feel and see the improvements! Absolutely brilliant first ever reflexology with Kerry they make a real effort to make you feel at ease. Would recommend to all my friends and family excellent business. Always a first class service and fantastic Reflexology and Massage. Helped Ease my pregnancy symptoms after just one session.